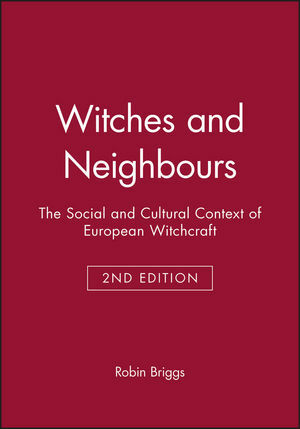 Witches and Neighbours is a highly original and unconventional analysis of a fascinating historical phenomenon. Unlike other studies of the subject which focus on the mechanisms of persecution, this book presents a rich picture of witchcraft as an all-pervasive aspect of life in early modern Europe. This book is not available from Blackwell in the United States and the Philippines. A fascinating and accessible account of the central role of witchcraft in early modern Europe. A standard work on the subject of witchcraft now available in a revised edition with an updated bibliography. Argues that witchcraft was as complex and changing as the society of which it formed a vital part. Draws on a range of original sources to vividly illustrate the arguments. Robin Briggs is Senior Research Fellow at All Souls College, Oxford where he has worked since his election as Prize Fellow in 1964. He was educated at Felsted School and Balliol College, Oxford and he is the author of The Scientific Revolution of the Seventeenth Century (1970), Early Modern France (2nd Edition 1998), and Communities of Belief: Cultural and Social Tensions in Early Modern France (1989).